Zoo manager Ross Snipp said although it was early days the cub looked to be "very strong." Its birth followed an earlier miscarriage by its mother. Ms Snipp said: "We would not normally make this announcement so early but we are so proud of our work in this particular field that we wanted to give as many children as possible the chance to see him or her before the schools go back." 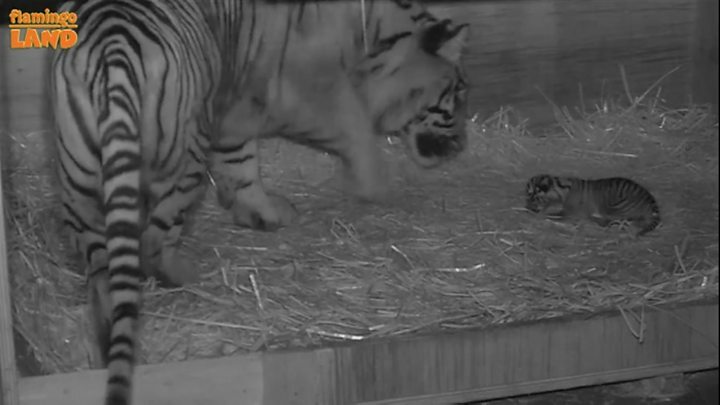 The cub's parents arrived at Flamingo Land in 2010 in the hope that they would produce offspring as part of a worldwide conservation effort to save the Sumatran tiger from extinction.